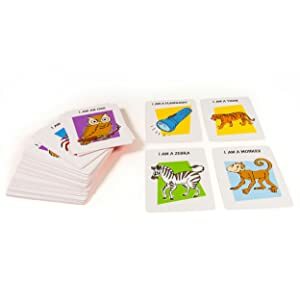 The Hedbanz game comes with a stack of picture cards, each featuring an animal, food, or common object. The categories are few and simple, but this allows everyone, even young children, to get in on the family fun. And because you’ll be racing against the one-minute sand-clock timer, each round moves quickly, ramping up your energy and challenging your wit. This board game comes with everything you’ll need to play. Your group of two to six players will be strapping on headbands, asking funny questions, and making wild guesses without complicated setups and rules. Playing Hedbanz is simple. 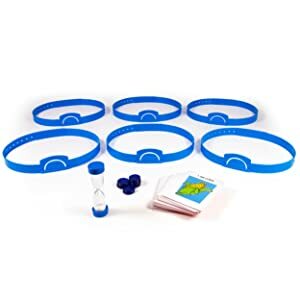 After dealing one card and three chips to each player, take your card and place it in your adjustable headband without peeking. 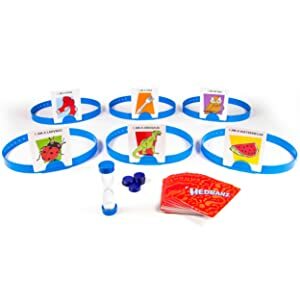 When your turn arrives, ask each player a question about who, or what, you are (‘Am I a food?’). If you get stuck, the sample questions card offers tips on the types of questions you might ask. When you get a yes, your questions will become more specific (‘Am I cooked?’ or ‘Did Dad serve me for dinner last night?’) until you’re ready to guess the answer (‘I am spaghetti!’). Hedbanz is not only fun, but inherently educational. Kids will flex their deductive reasoning skills with the game’s simple question-and-answer premise. By making connections and coming up with questions that will lead to answers, kids will also practice creative critical thinking skills. The first player to get rid of all her chips is the Hedbanz winner.